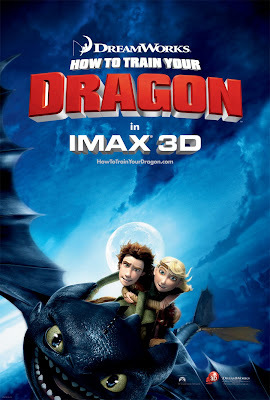 Dreamworks' kids spectacle How To Train Your Dragon follows Avatar in using 3D the right way, as the cinematic gimmick ends up enhancing the overall experience of watching dragons in flight. Josh, Alex and I went to a matinée showing of the movie yesterday. By matinée I don't mean matinée prices as the total bill for 3 people came to $35 (Thanks, over-inflated 3D prices!). I was worried that the boys would be restless since I opted out on the popcorn/drinks option this time. They both behaved very well and it was probably a testament to the movie which was exciting and well-paced throughout. The film tells the story of a young viking boy who is pressured by his father and the rest of the village to become a dragon hunter. The boy (named Hiccup) ends up realizing that dragons are a mis-understood species and are actually quite nice and loyal if you take the time to train them properly. The familiar themes of loyalty, betrayal and parent-child dynamics are present throughout the movie but what makes everything feel new and fresh is the incredible visuals produced by the wizards at Dreamworks Animation Studios. For the first time in an animated movie, I felt the sensation of flight during the flying sequences. The combination of wind effects, sound and the added depth that 3D provides helped convey an extremely realistic aerial tone throughout. We're really getting close to the stage in digital animation where everything we see visually is almost taking for granted. Dreamworks and Pixar consistently give us perfectly rendered characters, scenery and effects. The driving factor in digital animation over the next 10 years will be the story and voice acting. The story of HTTYD is clever and evenly paced. It's a little odd at first that the dragons in the film have the same mannerisms as cats, but eventually you just accept that correlation and it actually works by bringing the dragons and human characters closer together. The animators put a lot of care and attention to detail in how the main dragon (Toothless) communicates without words. I would say this movie is probably geared more towards kids of ages 7-11 (it is PG after all), but both my kids enjoyed it. Alex refused to put on his 3D glasses but still had a good time and hardly fidgeted. Josh said he was scared during some of the intense dragon scenes, but overall he loved the movie. I would recommend this to all my readers as a movie to see in the theater in 3D. I don't think the flying sequences will translate as well at home on video, so make sure you get a chance to see it at your local multiplex before the next 3D sensation floats in. Kudos to Dreamworks for trying to keep pace with the boys at Pixar (this movie is MUCH better than UP by the way). I give How To Train Your Dragon a healthy 4.5 JRs and view this movie as an early contender for the animated Oscar award next year.